Though the teaser isn’t set to formally bow until Christmas (debuting during the network’s NBA Christmas Day game), ABC and late-night host Jimmy Kimmel are letting viewers in on the greatest stocking stuffer they could ever get: a ton of eyeballs watching him host the 90th Annual Academy Awards. Oh, and a jetpack. 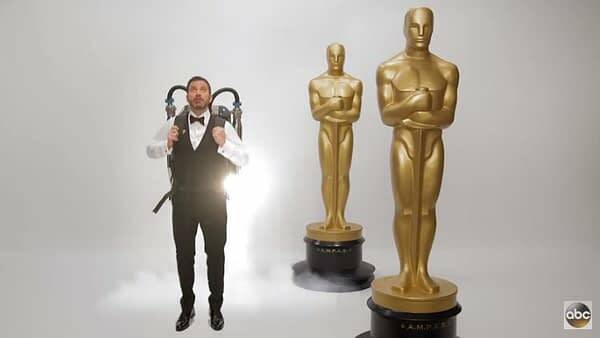 Kimmel wants a jetpack. Which when you think about it, it’s a pretty fair request considering we’ve been promised jetpacks and flying cars even well before the days of The Thunderbirds and Captain Scarlet. The 90th Annual Academy Awards are set to air live on Sunday, March 4th, 2018, at 8 p.m. ET/5 p.m. PT, which will have the awards ceremony airing a half-hour earlier than previous telecasts. The 90-minute Oscars pre-show is set for 6:30 p.m. ET/3:30 p.m. PT; and will include live coverage from the red carpet; interviews with nominees, presenters, and performers; and behind-the-scenes moments from the Dolby Theatre. This is actually the Jimmy Kimmel Live! host’s second consecutive year as Academy Awards host, receiving both viewer and critical praise for his freshman run at the job last year (which was also the year of the infamous Moonlight/La La Land debacle over the ‘Best Picture’ announcement). Kimmel also hosted the 2012 and 2016 Primetime Emmys. Michael De Luca and Jennifer Todd will also return to produce the 2018 broadcast. Coinciding with the domestic broadcast, the 90th Annual Academy Awards will also air live in more than 225 countries and territories across the globe.